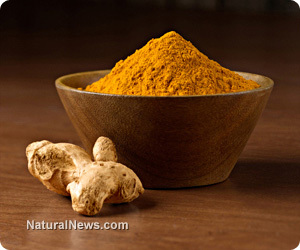 (NaturalNews) You probably know by now that turmeric has been acknowledged as a potent anti-inflammatory, antioxidant, and anti-cancer substance. Turmeric is a rhizome with edible roots that grow underground horizontally. It's actually related to ginger and somewhat resembles it outwardly. Turmeric's active ingredient, curcumin, is often extracted and used in many clinical studies for cancer and chronic inflammation such as rheumatoid arthritis. But there are ways to enjoy turmeric as a spice to please your palate and add its active ingredient, curcumin, as a daily part of your body's biological chemistry. Regardless of recipe differences, keep in mind that for optimum curcumin absorption from turmeric, three basic elements are required: cooking heat, a touch of black pepper for nutrient absorbing piperine, and a healthy fat of your choice to protect the turmeric's curcumin from stomach acids before entering the small intestines. You can choose one or two fats from the following cold-pressed or organic fat sources: Ghee, almond oil, olive oil, coconut oil, coconut milk, almond milk, or goat and cow milk. Soy milk and Canola oil are not the best choices. (1) Turmeric can spice up your rice dishes. It's especially appropriate for organic white basmati or Indian "parboiled" rice. Parboiled white rice is often from India, and it is nutritious and digestible enough to be recommended by Ayurvedic doctors (http://www.wisegeek.com/what-is-parboiled-rice.htm). By the way, Asian rices generally contain less arsenic than domestic rices. Make sure the rice isn't overcooked or soggy, then lightly stir-fry the rice in a suitable pan with a cold-pressed organic oil of your choice sprinkled with black pepper. Add some chopped cilantro and/or whatever salivates your taste buds. (2) Eggs can be fried or scrambled using butter or coconut oil with a liberal sprinkle of turmeric and sea salt. Don't forget the pepper. (3) Spicy lentils. Use green or brown lentils that can be cooked in around a half-hour with a two-to-one liquid to lentil ratio. You might try organic vegetable stock instead of purified, fluoride-free water. When the lentils are almost done, lightly stir fry-turmeric powder in ghee or coconut oil. Mix the turmeric and oil and with the lentils and some black pepper. (4) You can create a similar dish with chick peas or garbanzo beans. If you use canned garbanzo beans, make sure they are organic and the cans are labeled BPA-free. But it's healthier and cheaper if you simply soak dry bulk organic chick peas in pure water overnight and boil them for a half-hour or so. Either way, coat the chick peas with plenty of turmeric powder, black pepper, and some sea salt mixed with an organic cold-pressed oil of your choice. Then lightly roast the mixture on a medium level oven setting for 15 to 20 minutes. (5) A cooling turmeric summer elixir can be prepared by first boiling some turmeric root, letting it cool down somewhat, discarding the root and adding honey, lemon or lime, and a dash of ground turmeric with a pinch of black pepper. Pour over ice and enjoy. (6) How about a smoothie? You can blend a half or a whole banana with some grated or powdered ginger, raw honey, freshly squeezed lemon juice, a teaspoon of bee pollen with two teaspoons of turmeric paste made by stirring turmeric over heat in ghee or coconut oil and black pepper. Blend with activated almond milk. Dana will tell you how to make activated almond milk here (http://www.foodcoachnyc.com). (7) Here's a convenient way to ensure your daily turmeric: Prepare a turmeric paste that you can refrigerate for several days and use to quickly prepare a "Golden Milk". Here's a show and tell for that (http://www.youtube.com/watch?v=jYCQb2YNGt4).